A while ago I wrote a post about the discovery of a new Radox Coconut Shower Gel which you can find HERE and along with Coconut there are two other fragrances to try - Cherry Blast and Berry Burst. I was sent a package of all three Shower Gels and I have been using them for the past few weeks and here are my thoughts. As you can see above, the three shower gels are all really nicely packaged and are certainly eye-catching and stand out amongst other shower gels on the shelves. Starting with Cherry Blast which you can see on the left in this photo, it stands right out with its striking red packaging and with the picture of Cherries jumping right out at you, you can guess what it smells of. Upon flipping the lid of this shower gel, I wasn't surprised to find that the shower gel was a lovely bright vivid red colour and as soon as it hits your skin alongside hot water it lathers instantaneously and turns the lather pink, for me this is joyous because I love pink and I love lather but what I wasn't expecting was the amazing aroma of cherries, not a chemical smell at all, but fresh ripe cherries there in my shower, simply divine. What they say - "For girly girls who like to feel gorgeous all day long then use Cherry Blast: This cherry-licious shower gel containing juicy cherries, milk and citrus oils has a sweet, tantalizing fragrance that will invigorate your senses and energize you in the morning as well as leaving your skin feeling soft and smooth so you can feel gorgeous whatever the day throws at you." Well it most certainly does smell cherry-licious and the scent lingers on your skin for hours, add to that it smells wonderful in your bathroom. Coming next is Berry Burst and it is sold in a lovely shade of purple and on the front of the bottle are pictures of berries, so you are in doubt as to what it is. As soon as you flip the lid, the first thing that hits you is the wonderful aroma which you can clearly detect as being a mixture of berries and it isn't subtle by any means. Once you squeeze the tube, for me this is where I am slightly disappointed because the shower gel isn't the bright purple I was hoping for, with the two other shower gels in this range, the shower gel matched the packagaing, this shower gel was white in colour and very similar to Coconut Kiss which you can see above and below in the photos. However, the colour of the gel aside, again as soon as the gel comes into contact with hot water, it promptly lathers and the berry aroma surrounds you and wafts its way through your home leaving behind a lovely lingering scent. What they say - "If you live life in the fast lane why not indulge in Berry Burst: Scrub up in your shower with this sumptuous shower gel containing berries and milk. It's bursting full of energy so you will be feeling fully charged and ready to face the day with a spring in your step." Again there is no doubt that this shower gel smells of a lovely burst of berries. These shower gels are currently on offer in local supermarkets and high street stores like Boots, though I would happily pay the full price of £2.15 for any of them. You can find these products in Boots, Sainsbury’s, Asda and Savers. · ‘Super’ power showers are costing the average family £928 a year and an individual person over £18,000 in their lifetime- the same as the average deposit for a terraced house in the UK. Oooh sounds delicious! Will have to give these a go!! Im not keen on coconut scented products, but the Cherry Blast and the Berry Burst both sound lovely...but sadly not available here in Australia!! 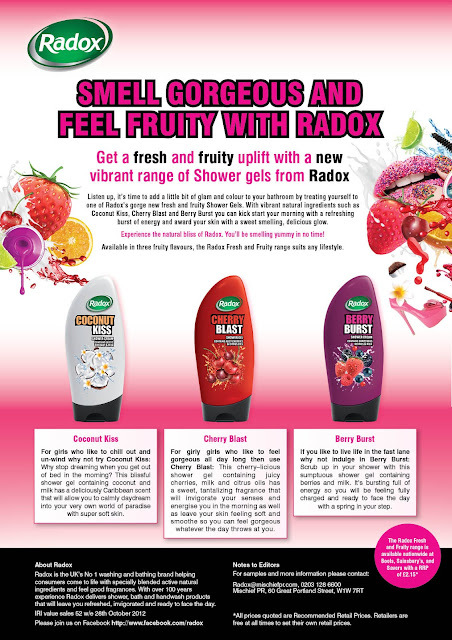 And that shower study done by Radox...interesting facts!! I follow you :-) Also with Bloglovin!!! !